Fig. 9.1. 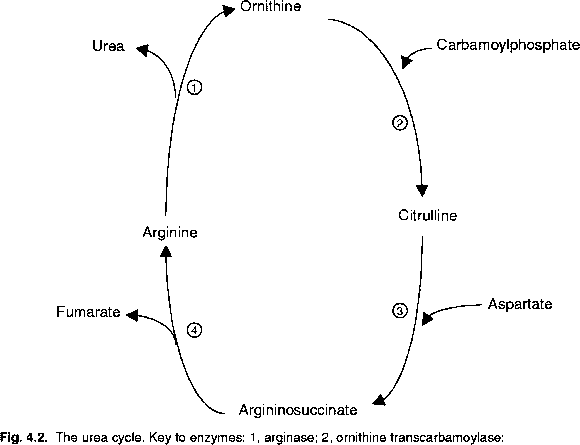 Essential amino acids and synthesis routes of semi-essential and non-essential amino acids. the ARC (1981) lysine was used as reference for the other amino acids. Tryptophan has also been suggested as a reference for the other essential amino acids (NRC, 1988). However, it is now generally accepted that lysine is most suitable (ARC, 1991; NRC, 1998). Some very good reasons for using lysine as reference are: (i) lysine is commonly the first limiting amino acid in practical diets, (ii) lysine is the most investigated amino acid with respect to requirement; (111) the requirement for lysine is, together with leucine, higher than the other amino acids; and (iv) lysine does not contribute quantitatively to other specific functions than protein synthesis. The order of essential amino acids describing the ideal amino acid profile in relation to their general order of limitation in common cereal-based diets is given together with their specific properties in Table 9.1. Furthermore, the essential amino acids can be separated into two groups according to their general degree of limitation. 1. A primary limiting group which includes lysine, threonine, methionine (and sulphur amino acids) and tryptophan. The requirements for these amino acids can generally be met after supplementation of industrial products of lysine, threonine, methionine and tryp tophan. These amino acids are generally used for improving the protein quality in the diets in practical pig feed production. 2. A secondary limiting group which includes: (i) isoleucine, leucine and valine (all branched-chain amino acids); (ii) histidine, and (iii) phenylalanine (and aromatic amino acids). Each of these amino acids can become limiting when the diets are supplemented with amino acids from the primary limiting group. However, at present the amino acids from the secondary limiting group are not commercially available at reasonable prices. Furthermore, due to the present insufficient knowledge on their precise requirements the benefit for a further reduction in the dietary protein level by their supplementation is difficult to assess. The first proposals for ideal amino acid profiles referred directly to the concentration of amino acids in the diet. 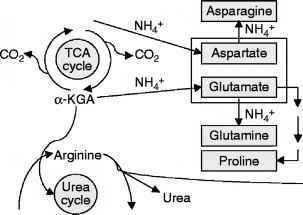 However, due to variations in the availability of the individual amino acids in dietary proteins the profile should rather be related to the available amino acids in the diet. Generally, the ileal digestibility is considered to be the most correct measure for availability, although the availability of some amino acids, e.g. lysine, may be overestimated by this method, in particular in heat treated feedstuffs (Batterham, 1994, Moughan and Rutherfurd, 1996). Table 9.1. Essential amino acids according to their general order of limitation in common practical diets for growing pigs. Several tables of apparent ileal digestibility of amino acids were published about 10 years ago and ideal amino acid profiles have been suggested on this basis. However, as discussed by, for example, Boisen and Moughan (1996a,b) and Mosenthin et al. (2000) values of apparent digestibility are influenced by the total, i.e. basal plus extra feed specific, endogenous protein losses during the digestion processes and, therefore, are influenced by the protein level in the experimental diets used for their determination. On the other hand, values of standardized (or true) digestibility only include the feed-specific losses which are correctly debited on the feedstuff itself. Therefore, for obtaining maximal accuracy (and general validity) in the ideal dietary amino acid profile, it should be related to values of standardized digestibility of the individual amino acids. It is now generally accepted that values of standardized ileal digestibility of amino acids are those to be used in practical feed evaluation. Recently, several tables on true or standardized ileal digestibility of amino acids in common feedstuffs for pigs have been published (NRC, 1998; Rademacher et al., 1999; CVB, 1999; AmiPig, 2000; Pedersen and Boisen, 2002). Furthermore, in order to optimize efficiency, and also to reduce surplus-N, the optimal ratio between essential amino acids (EAA) and non-essential amino acids (NEAA) has been defined (Wang and Fuller, 1989; see also Chapter 6). On the other hand, experimentally determined EAA/NEAA ratios are influenced by the composition of the NEAA in the experimental diets, as well as of other available N-compounds, e.g. nucleic acids. Therefore, a more precise characterization would be the ratio obtained from the amounts of standardized digestible EAA-N and total-N, respectively. Alternatively, the ideal profile of essential amino acids can be directly expressed in relation to crude protein (g kg-1 CP or g 160 g 1 N). This results in a simple and more informative definition of the dietary ideal amino acid profile. Furthermore, from these values the theoretical biological value (BV) of the diet, as well as the single protein sources, can be directly calculated as discussed later. In conclusion, the ideal dietary amino acid profile refers to the optimal composition of the available amounts, i.e. ileal standardized digestible, of all the essential amino acids and N in the diet. Then, the dietary supply of all individual essential amino acids, as well as of N, should be equally limiting for covering the actual requirements for a certain production.